I came across this today thanks to a link on the WW2Talk forum. The British Pathe site is a real treasure trove. This is a 5-minute piece about CRUSADER’s early stages. A lot of varied shots, including a very rare bird, the de Havilland D.H.86 Express in the air ambulance role. I would place the film into early December, after some setbacks, but before the relief of Tobruk. It also shows very good footage of the 4.5″ mediums of 7 Medium regiment being fired. There is another bit of unused footage, showing in particular Honey tanks buzzing around the desert, and tentatively dated also to December 41. There appears to be no sound. It looks to me as if this was leftover of the previous reel. On 17 January 1942 the Axis garrison of the Halfaya Pass surrendered, just before a final attack was supposed to go in and capture the pass. It consisted of about 6,000 men, with ca. 60% of them Italian, and the remainder German. The commander was the Italian General Fedele de Giorgis, General Officer Commanding 55 ‘Savona’ infantry division, who was awarded the Knights Cross for the defense he conducted. After the war he became commander of the Carabinieri corps of the Italian army. More famous is the senior German officer, Major Wilhelm Bach, a former protestant priest, who commanded I./SR104, the German motorised rifle battalion charged with the defense of the pass. The final two weeks of the defense must have been hell for the defenders, and the ca. 75 Commonwealth POW which were encircled with them. There were little to no rations left, and access to water had been lost as well. The surrender became inevitable after this. Just a few days before a vicious little battle was fought for the town of Lower Sollum, which was captured at a cost of about 100 casualties by the South African forces of 2 South African Division, which besieged the pass. The position was under constant bombardment by the Blenheim light bombers of the Royal Air Force and the ‘Lorraine’ Squadron, the first operational unit of the Free French Air Force in the Western Desert. Attacks were so heavy that questions were raised about the efficacy of the effort in Whitehall. A token effort was made to bring in supplies to the garrison by air from Crete, but this was hampered by weather, lack of communications, and interference by Commonwealth night fighters. 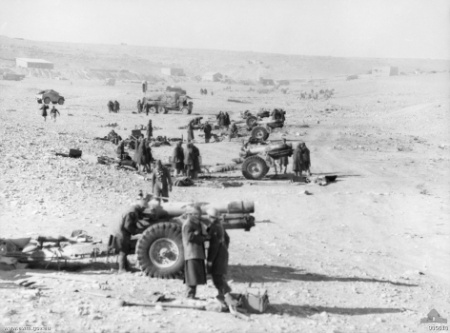 The continued defense of the pass, even after Bardia had fallen to the assault of 2 South African Division on 2 January 42, contributed to the serious supply shortage that hampered Commonwealth operations west of Tobruk so severely. It had a major strategic and operational impact, and the loss of the garrison was well worth it, as far as Axis planners were concerned, even though it is clear that Rommel himself felt badly about leaving behind so many of his men, and so much material. The Australian War Memorial has a series of pictures of one of the raids, which I reproduce below, followed by some pictures taken after the pass was re-captured. The text is the original text associated with the photos. A big round of applause to the Australian War Memorial for making these pictures available to all. Western Desert, Egypt. 20 January 1942. Flying over Halfaya soon after the surrender of the garrison on 17 January 1942, an Air Ministry photographer took this aerial photograph which shows knocked out tanks, armoured vehicles and emplacements. To the right can be seen the graves of members of the garrison. Courtesy AWM Med0306. Every so often it is good to be reminded of the human cost of the events that this blog is talking about. I came across this picture, which shows the German war cemetery at Fort Capuzzo (thanks to Trapperjoe of the Deutsches Afrika-Korps Forum) in a British war diary. Fort Capuzzo had of course seen very heavy fighting throughout 1941. It must have been snapped while driving past on the way to or from the frontline, either in December 41, or in February 42. It is rare to find pictures by British soldiers, since as I understand it, the use of cameras was not allowed, unlike in the German army. Not directly relevant to CRUSADER, but I pulled the 1 Armoured Division Royal Artillery branch war diary (WO169/4056) at Kew, and found it only starts from April 1942. So this info is more for the folks who are interested in the Gazala position during the static period of 6 February to 26 May 1942. 102 A/Tk Rgt’s 288 Bty is struck through in the table, with its 12 2-pdr guns, and it appears these have been added to 144 Fd Rgt. Could be captured German Pak 38?